Removing Age Spots is very easy using the Areton One (Skin Re-Surfacer)! If you have developed Age Spots, using make-up as a long term solution is something of the past. You do not have to spend thousands in laser treatments or other expensive aesthetic treatments in order to remove your Age Spots. 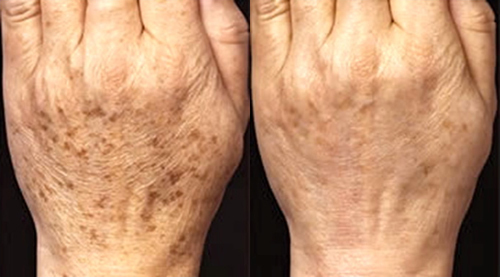 Visibly fade your Age Spots is not as expensive as it used to be thanks to the New Areton One (Skin Re-Surfacer). The Areton One allows you to achieve just the same results you would get if you were to spend thousands on Age Spots Removal treatments at the top cosmetic clinics. The Areton One is formulated in a thick gel. This allows us to use milder peels than those used in cosmetic clinics, whilst achieving the same results you would otherwise get at your beauty therapist’s office from the comfort of your home for for a fraction of the price. With the Areton One we have taken the best of lastest technologies in aesthetics and cosmetics available to top aesthetic clinics and bring it directly to your door step, so that you can achieve similar, and in case of age spots removal, just the same results you would get in cosmetic clinics. Why is the Areton One home aesthetic treatment very effective for Age Spots Removal? It is very well known that one of the best ways to remove Age spots is the use of skin resurfacing products or exfoliants. The types of peels we use in the Areton One (Skin Re-Surfacer) in particular, have been scientifically proven to be effective in the removal of age spots. Also the type of active peels we use in the Areton One have been used in cosmetic clinics for age spots removal over many years always leading to the eventual removal of the Age spots. The main principle behind Age Spot removal using the Areton One (Skin Re-Surfacer) is the very well known principle of exfoliation. Although the pigments of the age spots are sometimes rooted inside the dermis repeated ex-foliation of the age spots will lead, over time, to their removal. Also the dedicated skin brightening peptides renew the natural youthful glow of your skin. Additionally, because Age Spots are often dermal hyper-pigmentations, any aesthetic treatment for Age spot removal does require a number of treatments in order to show visible results, be it laser treatments, voltaic plasma or other. Therefore you cannot usually expect to have all your Age spots removed effectively within one, all in one treatment even if they are performed at cosmetic clinics. A number of sessions may be required anyway. the advantage you have with the Areton One is that you have virtually the same tools the beautician has for this type of treatment but at your own home. Therefore you can save tons of time and money by simply achieving the same results you would with a professional cosmetic peel at your beautician’s office. The Areton one delivers what it promises, it will progressively fade your agespots in the same way you would have in a cosmetic clinic, however it is not a miracle cure. 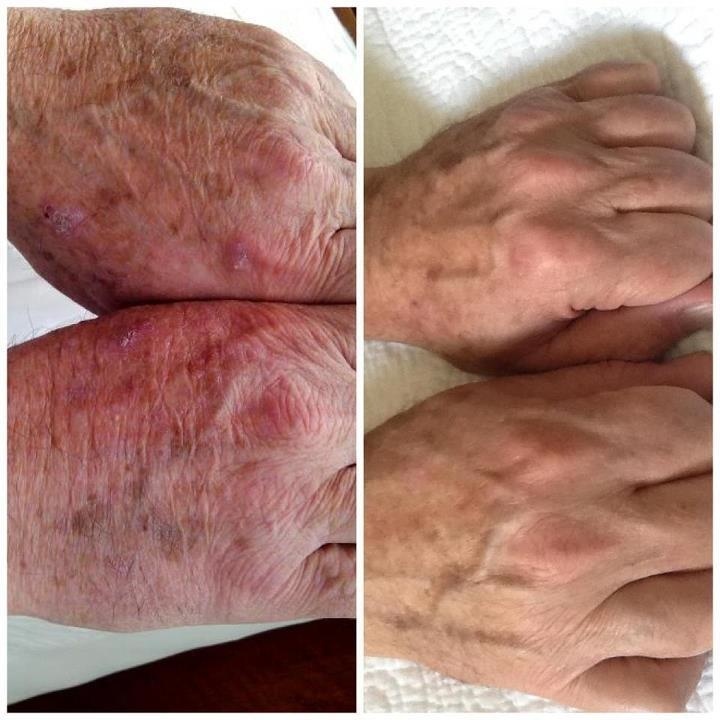 Like laser treatment, micro-needling, voltaic plasma, professional cosmetic peels and any other type of skin resurfacing technique, the Areton One (skin Re Surfacer) does require a number of treatments in order for you to achieve complete removal of your Age Spots. Generally it takes 4 to 5 average duration treatments with the Areton One in order to achieve complete removal. However after each treatment you will be able to notice appreciable fading of the over pigmented area. It is always better to take plenty of before pictures to compare the results for yourself. Since the improvements are relatively minor after each treatment people will tend to forget what they looked like before they started the treatment. Also, you can expect a generally tighter and smother skin after the the applications required to remove your Age Spots with the Areton One thanks to the products rejuvenating properties, of Vitamin A and its dedicated peptides. .